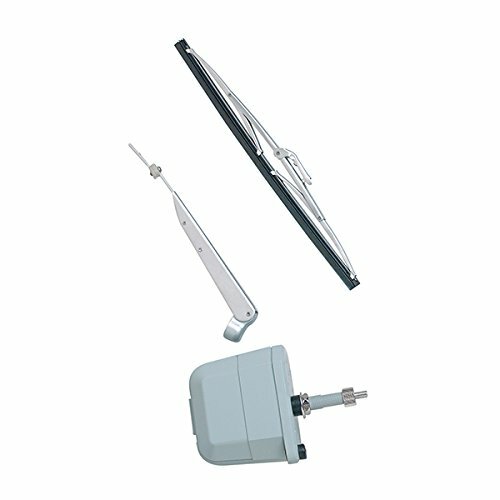 The AFI 500 Wiper Motor Kit consists of a waterproof standard wiper motor, a stainless steel curved wiper blade and an adjustable stainless steel arm. AFI's 500 Wiper Motor is enclosed in a waterproof, thermoplastic housing, and is designed for exterior installation. Draws 2 AMPs max power, and features self-parking wipers that return to the off position automatically. This motor is a standard motor, and is designed for light duty use. Runs on 12V power. The 11.5" deluxe stainless steel curved wiper blade works well on curved or flat windshields and features a marine-grade silicone squeegee. The deluxe adjustable stainless steel arm has an articulating/bend-back feature, and is designed for use on standard and heavy-duty motors.